*We earn 95% of the sale via Gumroad. Same price to you! 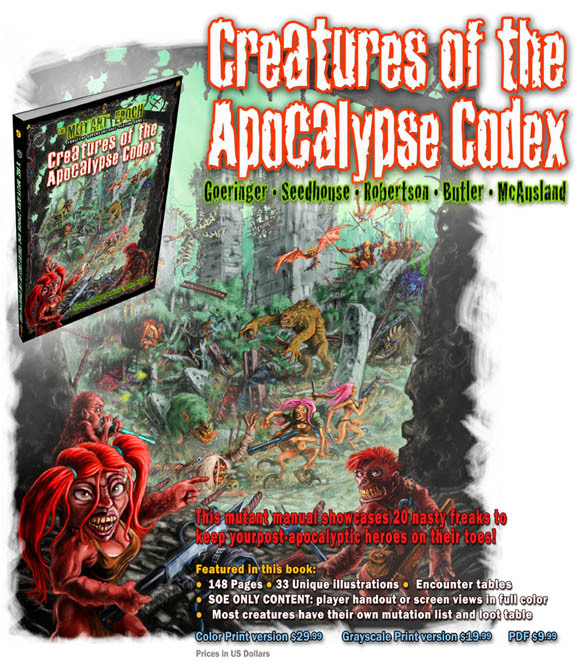 This mutant manual showcases 20 nasty freaks to keep your players on their toes. 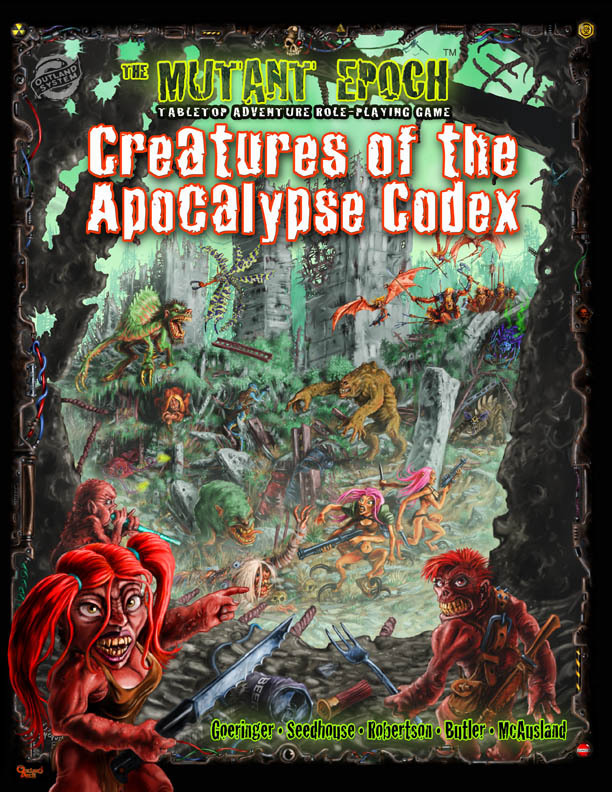 Included in this tome are the first 13 deviant adversaries from the free PDF offerings: Sickle Foot, Red Harvester, Spikeback, Junk Mobster, Bog-Billy, Scraplurker, Back Hatcher, Quasi, Spiker, Wailing Jhonny, Tyrannosapien, Chest Head, and Talontessa. 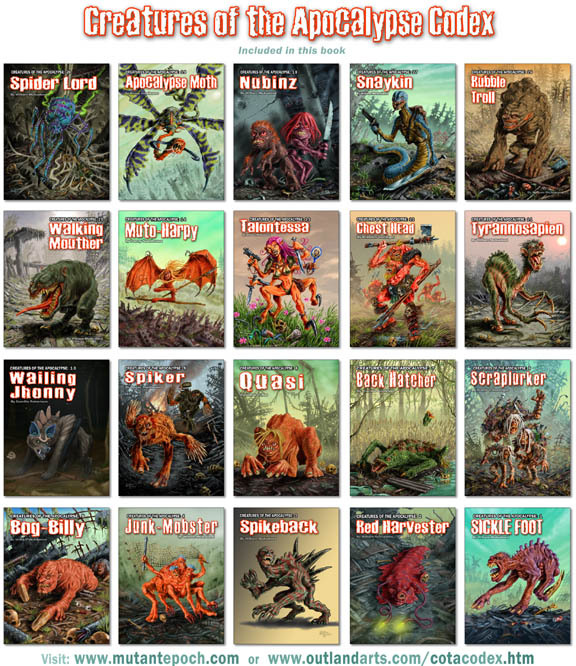 Also included is the disturbing Muto-Harpy which was previously only available to Society of Excavator members by way of joining our forums, and six never before seen nasties including the troublesome little Nubinz, the grotesque Walking Mouther, slithering, highly venomous Snaykin, enormous yet varied race of Rubble Trolls, winged terror called the Apocalypse Moth, and most fearsome, intelligent and terrifying of all, the Spider Lord. This collection of deviants were illustrated by William McAusland and Camille Robertson, with creature design and writing by Danny Seedhouse, Brandon Goeringer, James Butler, Camille Robertson, and William McAusland. See the 9 page PDF demo right here.